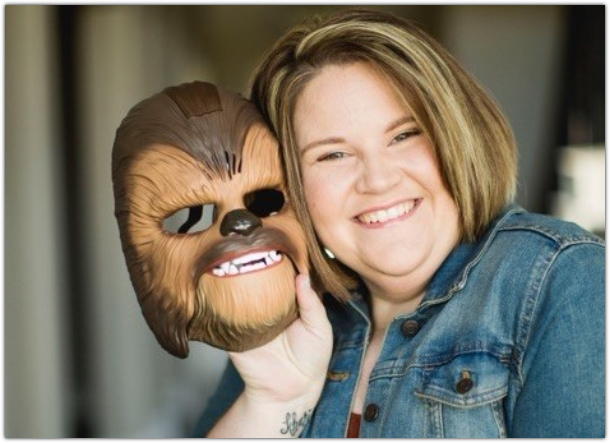 Episode 2 of our “For the Love of Laughter” series features “Chewbacca Mom” herself - Candace Payne! You may remember a little video of a mom in her car who bought a Star Wars Chewbacca Mask (presumably for her kids), but was so entertained by it herself, she couldn’t stop laughing! 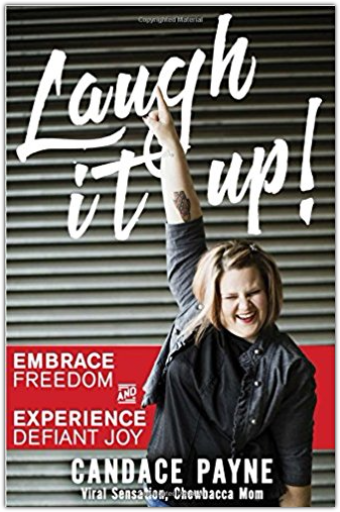 Candace and her infectious laugh went on to capture America’s hearts (with over 175 million views), and she has since been on a slew of talk shows including Good Morning America, The Late, Late Show with James Corden, and Entertainment Tonight. It wasn’t always easy for Candace to laugh unabashedly. 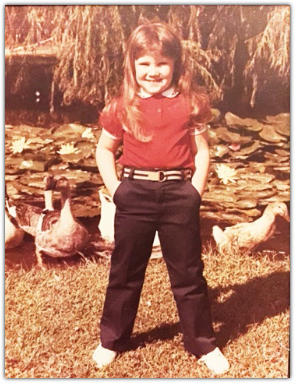 Emerging from a tough childhood that included a period of homelessness, she battled depression and self-image issues. Today, she is resolute to recognize and appreciate the simple joys of life. She and Jen discuss everything from their favorite comedians, to why tacos are an all-important food group, to why everyone should have a crazy sock collection. Narrator: Hi everybody, my name is Remy. 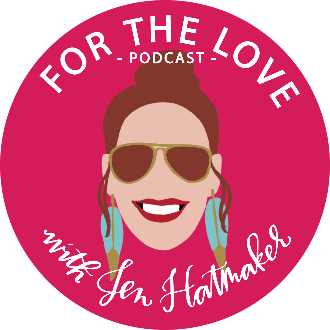 Welcome to the For the Love Podcast, with your host Jen Hatmaker, my mom. She writes books and speaks to crowds. But she mostly likes talking to amazing people, every week, on this podcast. Thanks for listening. We hope you enjoy the show. Jen: ​Hey, everybody. It's Jen Hatmaker. Welcome to the For the Love Podcast. So glad you're here today. This series is going to feature people who make us laugh, who are super joyful, and even people who sometimes can find the funny in things that are frustrating or hard or even sad. Today, we have on the show Candace Payne. 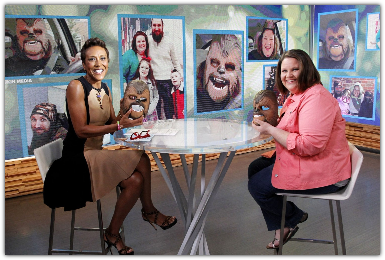 You might know her as "Chewbacca Mom.” Do you guys remember this? Candace came to the world's attention when she recorded this Facebook Live video a little bit over a year ago. She filmed it after she had just bought a Star Wars Chewbacca mask. Essentially, she cracked herself up so hard wearing it that she could barely speak. It is the funniest video. I'm sure you've seen it. If you haven't, we'll have the link on my website. You cannot watch it without laughing. You cannot watch it without falling in love with Candace and her crazy laughter. Anyhow, that video went super, super viral. Like 175 million views. Some crazy thing. It made a ton of people laugh and just boom, just like that, Candace is on this adventure. She is on Good Morning America and Entertainment Tonight and The Late, Late Show with James Corden. She's been everywhere. Everyone's talking about her. Ellen, everything. 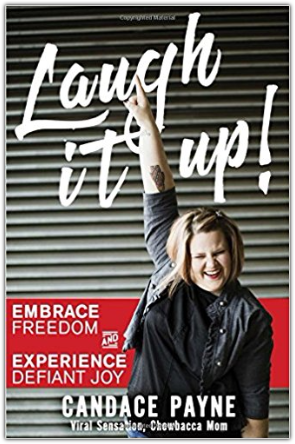 She's gone on to write a book called Laugh It Up. We're going to talk with Candace today about her experience, about her book, and really about the rest of the story because there's way more to her than what we saw in that four-minute video. You are absolutely going to love Candace. You're going to love her story. You're going to love her attention to the simple joys in life. 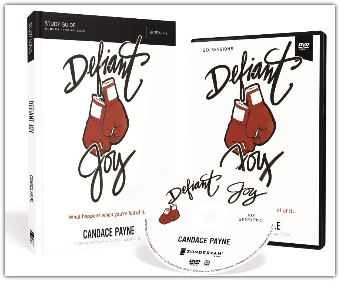 I'm thrilled to bring you this really fun conversation today with my new friend, Candace Payne. Candace, Candace, Candace. Welcome to the podcast, sister.​Candace: Hey. Jen: I'm glad to have you. Candace: Girl, I'm excited. This is a fun one. Jen: It is a fun one. You're a fun one. We met. We met last year. Wait, was it this year? It was this year, right? Candace: Yeah, it was this year. Real friends. Real life. Jen: Real life. We put our arms around each other. We like touched bodies. Jen: We were in New York at Book Expo. Had you ever been to that? Probably not. Candace: No. No, it was overwhelming. Jen: What in the world? Yeah, you guys, that was my first time to go to Book Expo too. It is this big HarperCollins -- Candace and I both have books under the HarperCollins umbrella which is just this huge New York publishing house; we're under one of their imprints -- this was their entire HarperCollins author database at this fancy New York Tribeca rooftop situation like a movie. Candace: No. No, it's not. The thing is I have something in my mind. I'm like, "Keep it together, like KIT. Keep. It. Together." Candace: Like, it's only when I'm surprised that I lose my junk. Listen, I was on The Harry Show. Candace: Harry Connick, Jr. Show. Oh, my gosh. I wasn't prepared. ​Candace: I didn't get to meet him before we get on stage to do the interview. I walk out, and I give him the biggest hug. I promise you this is how stupid I am. I whispered in his ear while we're hugging, "I'm not letting go until you do." Candace: I realized his face turned from "This lady's fun and cute" to "Security!” I mean, like the whole interview sucked after that because he was scared to death of me. It was like Kathy Bates, and I'm Misery. I'm sitting here going, "I've ruined it. I've ruined it." Jen: Oh, my gosh. I would absolutely do that. I get so weird. It's that, too. Although, I'll tell you, when I met Anne Lamott, and I love her too much, and that was the problem. Also, if I over-love you, you can guarantee I'm going to be a weirdo with you. Jen: I over-loved her, and I finally got to meet her. I had time to think about what to say to her because I was in line. I can't even say it was sprung on me. I had time. Instead, I get up, finally. I'm with one of my best friends, and I say to her as she's signing my book, I said, "Listen, I love this book. I want you to know that I actually read it in three consecutive trips to Barnes and Noble without buying it." She was like, "Thank you?" Basically, I stole your content, and I didn't pay you for it. My friend looked at me like, "Why are we friends?" Like, "Why do I bring you in public?" Candace: See? At least that's what you thought of. I was hiding my crazy because if I had time to think, I actually filtered myself down to, "I'm not letting go until you do" because I was wanting to sing, "It Had to Be You" from When Harry Met Sally to him. Candace: It's not a good situation. Jen: I want everybody to learn from your mistakes right now and just commit to their future path to never sing to their favorite celebrity when they meet them. That's it. It's just that simple. That's free advice everybody. You're welcome. Okay, so Candace. This year has been bonkers for you. ​Jen: Literally, a crazy, crazy year. To all my listeners today, unless you're living under a rock, you have for sure seen Candace's video where she made the whole universe die laughing with that Chewbacca mask. What in the world? You got the delightful and lovely nickname "Chewbacca Mom" which is what we all dream to be called. Candace: Yeah, I was hoping for "Wookie Woman,” but it didn't stick. Jen: Totally. Just talk. How did all this happen? I know in your wildest imaginations you never could have imagined sitting in your car, recording that little video of you laughing with a mask on in your car with your phone, and that leading to this year that it has led to, right? Is this just crazy? Candace: It is crazy. You know what? It was Thanksgiving break, and I had taken a full week off. My kids were out of school. It was like the first breath I've been able to catch in 18 months. Candace: I'm telling you. I was like, "What in the world?" Yeah. I didn't even realize it was that crazy. I just feel like I've been trying to catch wind. Riding that wind wherever it's been taking me for 18 months. When you say "bonkers,” it literally has been bonkers. Jen: I believe you. I believe that these amazing, beautiful, wonderful things have swept you off your feet. There's no way for them not to. Jen: I've got the link to your video up on my site for the three people listening who didn't see it when it went out the first time. There's something so fun about that video. The straight sheer joy of it. There's no pretense at all. There's nothing except for joy and laughter. Even Ellen, my queen, Ellen DeGeneres, she says to you, "You make everybody happy." Can she say anything nicer in the universe to a person? It's so amazing. I think people have, in the entertainment world, obviously, have seen this value in you, this joyfulness. There's something really special that you bring to bear in the world, frankly, that's sorely needed right now. Let's go back. Can you tell everybody where you were before any of this hit? Before we met you. Before we saw you in that car, and how we've seen you since. You've had some obstacles along the way, frankly. Tell everybody a little bit about how you honestly pushed through some pretty stout challenges to develop this sort of joy that you now have on full display. Candace: Well, you know what? It is so easy to look at somebody on the internet and just get a one-dimensional grasp on who that person is and love them just for that. What I thought was really funny were some people that had maybe said, "Oh, she was probably born that way. She's just one of those happy people." Candace: Then, also, there’s this idea that she must have a silver spoon because she's a stay-at-home mom, and she gets the luxury of being at home with her kids. Nobody knows that it was an intentional choice for us to go to one income. We were literally, 18 months prior to that video, standing in charity lines for school supplies for your kids. Candace: I felt like what they saw in this pure joy moment of just laughing was fought for. Candace: It wasn't something that I was just like, "Hey, this is just me all the time." If that was me all the time, I wouldn't hang around with me all the time. Candace: Do you know what I mean? You're like, "Stop it." Candace: Stop laughing, you know? I wanted to sit down and be honest about, first of all, my journey: the fact that I've had to defy what life's thrown me through homelessness, depression, post-partum depression. Good Lord, somebody put some light on that. A suicide attempt. Marriage issues. Candace: Literally things that you would be like, "Wait a minute, what? Is she normal?" Candace: Yes. Then, also, to do something that I don't feel like has been done in a while. When we have this ethereal concept that we have a hard time bringing back to reality and grasping it in our normal life, we need to personify it. In the book, I wanted to personify joy kind of like Solomon did. When he spoke about wisdom, he was like, "She cries aloud in the street. She does these things." When I'm thinking, "How do I bring this concept to the pages so that people can discover Joy that maybe are missing out on it?" I realized the first time I met her was when I was homeless at nine years old. We were literally in a van. I mean, I'm sounding like Chris Farley more and more as I age. Jen: Totally. By the river. ​Jen: I actually love that part of your story. I super love that as all this attention comes your way and this unexpected spotlight finds you, that one of the very first things you do is bring your full story to the table. Actually, that draws me to you. That makes me feel like, "Oh, okay. She's a truth-teller. She's lived a real life." It does not take anything away from how funny and joyful you are. To me, it just adds to it and makes you somebody like, "Oh, I can trust this. I can trust you." Because, frankly, cheap joy is easy because your life's been easy. Jen: The joy you've had to earn… that lasts. That's sticky. That's sticky joy. That's the kind I respect and I admire the very most. I appreciate your honesty. Was it hard to be honest at all about your life? Or are you naturally transparent? ​Candace: It wasn't hard to be honest. It was hard to revisit as I was writing. Jen: Ah. That makes sense. Candace: For me, culturally ... Listen, I'm not prophet. This big word "prophecy" is hopping around in the Christian culture right now. 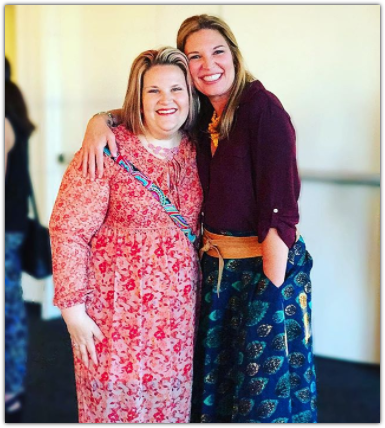 Don't be like, "Candace Payne gave a prophetic whatever." I'm just saying our culture right now, we value authenticity way higher than integrity. I mean, somebody can make the biggest mistake, and three days later, they'll come back and have a heartfelt apology, and everybody will be like, "They ain't so bad. They good. I love them. Shoot." Candace: I'm sitting here looking at this going, "Okay, well then, where are the people that are going to stand up and tell you good, bad, indifferent?" Don't edit. Don't edit it. Just say it. Jen: Yeah.Candace: Authenticity is something that I regard way higher than me being right or me being pretty about something. Do you know what I mean? 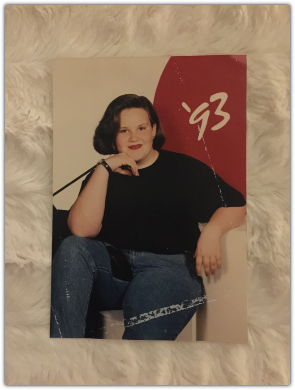 To go back and describe every detail… really, it got cut down a little bit in the final edit of the book because I realized you're going to have some teenage girls probably reading this with their mommas. There were some things I just wanted to be sensitive about so people didn't get so lost in the detail of what happened during sexual abuse or the night that I tried to commit suicide that they lose the fact that there's a greater story and a greater telling that they could find for themselves. My first raw cut was raw. That was the hardest part of writing for me because I felt so in the moment reliving what had happened. I'll be honest, if you're somebody that looks for positivity and tries to maintain hope and tries to embrace joy every single day, you don't revisit those spaces in your mind or in your heart very often. Candace: Before I could revisit. Yeah. Jen: I appreciate you saying that because this whole series, this is “For the Love of humor and comedy,” which is a really high value for me. I've always been drawn to comedy and interested in it and a student of it. All my favorite people are funny, or they're comedians. We're going to talk about some of our favorites here in a few minutes, but one thing I've always found interesting, just as an observer of comedy and comics and people who are just naturally funny, like you too, is that a lot of the people who bring us laughter, they're similar to what you're saying. They often have these circumstances in their lives that lean toward a darker nature, or towards sadness, or abuse, or some sort of harm or recovery. Jen: You end up seeing that a lot in comics. I appreciate you talking frankly, specifically, you touched on it, but I wonder if you could just talk to us a little bit more through some bouts of depression because I guarantee you that a ton of women listening today, that is something they either wrestle with or struggle with or suspect in their own lives. For some reason, it's still a little bit… it's not that it's taboo, but we still struggle with shame around it. We don't talk about it as openly as we should. Jen: Specifically, for as common as it is, my gosh. Jen: Can you talk a little bit about how any sort of depression has sort of had a space in your life? Jen: What you did with it.Candace: Yeah. Well, I want to be so clear whenever I tackle this issue. I'm not speaking about clinical depression, like a chemical imbalance. There was a season where I experienced that. That was because I was on a weight loss medication that is no longer available by the way. BTW. Candace: It literally jacked up the serotonin levels in my brain. I had to counterbalance it with antidepressants. Candace: That was one of the moments that I experienced depression, and it felt foreign to me. Like it literally felt like, "Who is this person?" I didn't feel like me when I was waking up in the morning. I didn't want to live. Candace: I didn't want to move. I didn't want to engage with people. I didn't want to watch my favorite comedians or funny movies. You know what I mean? Candace: It was like knee-deep into documentaries with history dramas. I'm sitting here going, "Who are you? Candace, wake up." Then, I've also known postpartum depression for hormonal imbalances when you're trying to get your life freaking back. I remember looking at my husband after having my first child, and I was like, "Okay, now, I know he's a good man. I know he's a good daddy. I'm watching that. I don't know who he is or how I ended up with him or if I even like him right now." Candace: I remember telling him that because I was just honest. He said, "Well, you better figure it out, because I'm not going anywhere." I was like, "Oh." Candace: I'm stuck with him, so great. I'm trying to figure that out. Candace: He's a great man. At the same time, I knew internally that I couldn't rationalize what I was feeling against those moments because there was something happening medically with me as well. The other thing was shame and regret. Candace: Listen, there is too much in me. I am nearing 40. I think when you just get to that age, you just don't have time to care about the things you used to care about. Candace: I'm sitting here going, "I don't even have time to process my past and everything I've screwed up for me to carry that junk anymore." Candace: If there's anything that had made me depressed and made me feel like, "Oh, I didn't do this by 25. I wanted to have this by 30. I wish that I didn't do this in my younger years, and I wish I didn't take that for granted." We could live in that space, but let me tell you what, you will be a curmudgeon by the time that you're 70, and nobody will want to be around you. You're going to be telling teenagers to get off your lawn and off your grass. Candace: I just felt like shame and regret were always stealing my joy and making me depressed as well. The last thing -- and this is something that I just feel like we don't address, and somebody needs to shine a light on it -- we would never speak to ourselves… wait a minute. Let me back up. Candace: We would never speak to our worst enemy the way that we talk to ourselves sometimes. Candace: How do you think you're going to feel at the end of your life if you believe everything negative you say to yourself? I just felt like those were the major killers of my joy and I needed to address them. Jen: What did you do? Was for you this a sense of awareness and initiative enough just to say, "I'm going to pump the brakes on this shame and guilt and regret and negative self-talk?” Were you able to flip a switch? What were some of your tools? ​Candace: Okay. I'm not trying to sell a book because I'm the worst at promoting myself. My publisher probably is like, "Candace, get better at it." Literally, Defiant Joy: The Six Session Study Guide is all my practical, tactile how-tos that I've been doing over the past six years. It really is. Like, I stopped talking negative to myself. Do you even know how freaking hard that is? Jen: No, it is hard. I don't even think most women are aware of it because that voice is so chronic and constant that it masquerades as the truth, and that's not at all how it is. That can be stopped, but it is not easy. Candace: I had a rubber band that I would wear on my wrist, and I would lightly pop my wrist every time I'd have a negative thought. Candace: Then, I would keep a tally in my phone. I would count them up at the end of the day. Sometimes when you do the actual math, you realize how ridiculous you're being. Candace: I would try to get down to where I would not have any more than 30. Candace: Let's just say the first day it was over 400 that I counted. Candace: I'm not even kidding. Jen: When you say that, you mean any negative idea, thought, or anything at all that was just going to be a hindrance of moving forward in a healthy way? Candace: Oh, my gosh. Well, like, you know, a lot of people that have come to know me, they joke about it, and they are like, "Oh, we love Candace, because she's got this self-deprecating humor." Well, no, there's a difference. I've done self-deprecation before, and that's one thing, but then there's also this beautiful thing about knowing what your limitations are. Candace: I don't have thoughts like, "Oh, I didn't realize that I couldn't do this." That's truth. Candace: Yeah. That one doesn't need to be put in check. That's reality. I'm never going to win an Olympic gold medal. We're fine. Candace: You can keep your thought. But the ones that would say, "You're not a good mom… "
Candace: Oh, oh, okay. Let's pop that rubber band right there. Candace: Or, "Your husband probably thinks you look disgusting in that shirt, so go change." Oh, no. Pop that. Jen: Down to 30 or less? Jen: That's a big change. I like that because sometimes our instruction toward healing and health, it's very, very internal. It's very introspective. It involves a lot of thinking or praying. There is what you're saying is true. Sometimes the path to healing is incredibly physical and symbolic. You do something with your hands or with your body or with a rubber band. The physical aspect of it can usher in healing just as much as just this deeply internal work. 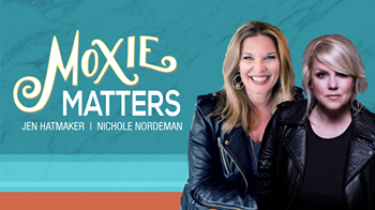 Second, in the spirit of my latest book, Of Mess and Moxie, and my good friend Nichole Nordeman's latest album, Every Mile Mattered, the two of us are hitting the road for the 12-city Moxie Matters Tour this spring. So, it starts January 24th and, you guys, really, it is such a great night. Tickets are as low as $24 and they are selling out by the day. So, grab your friends and get your tickets at MoxieMattersTour.com. Jen: Let's real quickly talk about these last 18 months for you. You've just been kind of all over the place. Give us the quick rundown. Who you've met, what shows you've been on, what your appearances have looked like, some of the highlights of this year that you surely never saw coming. Candace: Well, I think one big major one, it was like Sharknado of all things, was the CMAs because it was like everybody was there at one time. I was allowed across the rope to be on the carpet with them. Candace: There was nobody saying, "Sh. Step back. Don't be crazy, Candace." Candace: I'm like, "No, I'm invited. I'm invited." 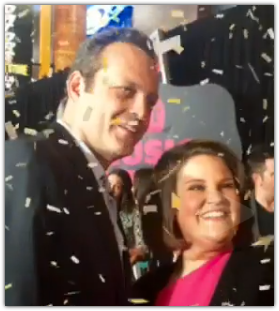 I actually tried to do photo bombing of Vince Vaughn. 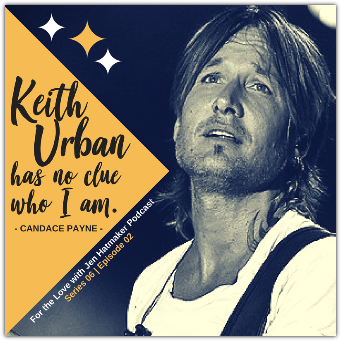 Candace: Keith Urban had no idea who I was. Him and Nicole Kidman were sitting two rows in front of me. It was so funny because I thought, "I've just got to go shake his hand." I don't even know why. You know? It's the dumb “keep it together” thing. Jen: Well, you're that close for crying out loud. ​Candace: "Keith Urban and china doll, Nicole Kidman." She's pristine. Anyways, I'm like flipping out on the inside. I just walk up to him, and I say, "Hi, Mr. Urban. I just love you as a judge on American Idol and your music." I'm like, "Hey, that was so stupid." Jen: Like the most Becky Basic thing to say ever. Jen: I would do the exact thing. Candace: I might have well just been wearing like boots and had a sweater and had the glasses and something Starbucks. Candace: I was just like, "Hey, basic." Candace: The irony of that moment is that there were like fans that were on the floor in front of us. As I'm talking to him, this was like maybe three weeks after the viral video, they're yelling out, "Chewbacca mom! Candace!" Candace: Keith Urban has no clue who I am. Candace: No. No. No. He's like wondering, "Who is this lady?" Right? Jen: This is the weirdest moment. Candace: They start laughing and then look at me and give me thumb's up. I'm like, "That's my life right now." Candace: That's weird. Then, Pharrell. 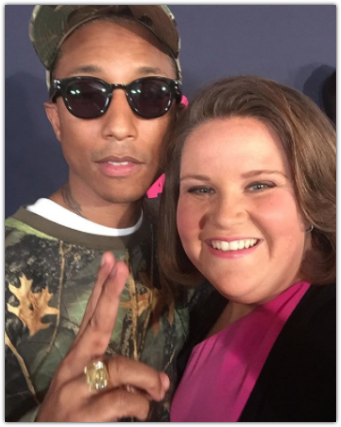 I met Pharrell and was like trying to keep my crap together. Just all of it. Just all of it. Once again, I say stuff, and I'm like, "I don't get it. I don't get it." Jen: That's so much fun. Your appearance with James Corden… hilarious. Jen: Sketch with J. J. Abrams… priceless. As you're going from this, "I'm going to make this silly one-minute video in my car" to CMAs and Keith Urban and James, now you're in all these shows, of course, people want to talk to you. They want you to say words. Jen: They want to ask you questions and for you to answer them. You've said you've literally just come up for air after 18 months. How did you handle the pace of it? The pressure of it? Were you able to open your arms wide and say, "This is a really fun, exciting adventure, and I'm here for it all"? Was it stressful? Or was it all of that? Candace: Yeah. Yeah. Insane. I woke up with voicemails from BBC, NPR, Fox and Friends, Good Morning America, The Today Show, some company in Ireland I don't even know. I mean, like crazy stuff. Candace: I'm sitting there, and I turned everything off that had a ding or a notification. I just felt like, "God, I need to eat. It's 12 o'clock. I haven't eaten. I've just been on the phone." All I could find was a freaking Moon Pie, right? Because that's what looked appetizing after not eating all day. Candace: I'm sitting on my kitchen floor criss cross applesauce with this Moon Pie half in my mouth, and I'm thinking, "This is going to be such a holy moment of like, 'Thank you, God. You've seen me. You remembered my life.'" I cried for 45 minutes. All I could say was “Thank You” over and over and over again. Nothing else could come out of my mouth because I knew this was one of those good works God was preparing for me. ​Candace: I didn't think for one second it was a fluke. I got up off the floor, turned everything back on, went crazy, did some interviews. Kohl's came to my house and gifted us three Christmases worth of Christmas that I hadn't been able to give my kids. Candace: My momma heart was exploding. Exploding. Then, my husband gets home from work, and I look at him, and I said, "Baby, I need to know right now. Is this just a fun ride that we're about to have? Or do you think this is something more?" He looked at me and said, "I can't deny that this is 100% God. We will walk through every open door." He said, "I am behind you every step of the way." Candace: I knew, "Okay, that's good." That's Friday. Monday morning I'm on Good Morning America. Off the camera, Robin Roberts just said to me, "You're the real deal. Not only that, but I've met so many people that are not ready for their “suddenly,” and you are. ​You are ready for your ‘suddenly.’" Then, that gave me this fuel. It was just like, "All right, if Robin Roberts thinks I'm ready, I'm ready." Jen: That was really powerful. ​​Candace: Oh, it was massively powerful. Then, the next day, I'm on the rooftop of Facebook headquarters. Candace: That was three or four days after this, so those were monumental moments to say, "I am with you. I go before you. I prepared this. I'm not going to abandon you in it. Just have fun.” If it's not been fun, I haven't done it. I haven't done it. Jen: That's great. That's great. That's so powerful and beautiful and liberating, honestly, because at that point, you're just free. You don't have to control it and micromanage it or white knuckle it, because it might all slip away. That just sets you free to be fully in the moment and enjoying it. It also probably allowed you to say, "Yes" more easily to whatever comes. Jen: You can't personally chart this kind of path. Jen: You can't manufacture it. Candace: You know, I think you would appreciate this out of all people. It did not tie my hands either to try to choose Christian versus secular. Do you know what I mean? Jen: I love that for you. Candace: Come on. I just had a Sunday School teacher that, after she saw me hug Sean Hayes on a Facebook Live post, she sent me a private message and was like, "Watch your witness." Jen: Oh, dear. Oh, no. Jen: Oh, no. Not today, Brenda. Candace: "Oh, my Lanta. Oh, my Lanta." I'm thinking to myself, "Okay, here's the deal. If I really do love Jesus like I say that I do, isn't the first commandment not to take His name in vain?" I don't need to salt and pepper Him in every single interview that I do. I don't need to prove to anybody that I believe what I believe. Candace: I just need to be myself. 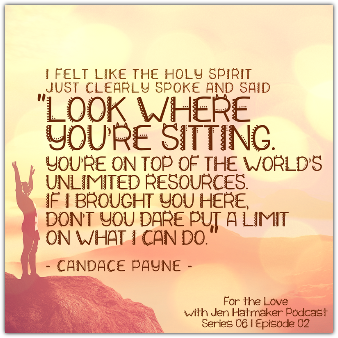 Candace: With God telling me I have no limits on me, do you know how freeing that was to not have to fit in either box? Jen: Yes, and it's rare. It's rare air, and I'm serious. Jen: Because you'll end up getting pulled from both sides. I know this too, because I have occupied mainstream space and Christian space. And sometimes they've weirdly merged and sometimes not at all. Jen: What generally happens is that one side wants you to be either more or less of what they want. Jen: You have to chart a course pretty early that says, "I'm just going to be true. I'm not going to dance like a monkey to make these people happy or these people on this side." Jen: I'm just going to have to hold to my center and trust that I know what that is and when and how it sort of is on display. Still, you have to have strength of character to pull that off. You've done it really, really well in a really beautiful way. Somebody told me one time… because our family has been sort of in some mainstream TV spaces too, and I got some similar pressure to be some sort of weird, secret evangelist on the HGTV channel. It was weird, and it would have been really forced. Really, really contrived. Candace: Well, that's not foreign. Jen: Oh, come on. I'm not a weirdo. Jen: I'm not going to act like a weirdo either. Jen: One of my mentors said, "Listen, Jen. As you are in these spaces, as you're working with your crew and your team and your production staff, this network, just being in the room increases the presence of the Holy Spirit just because you're there. You're walking in with the Holy Spirit in your life." She's like, "Already, it's spiritual. It's spiritual because you're in the room." Jen: I've never forgotten that. Sometimes we walk in with the power of the Holy Spirit on us and in us and through us. Jen: That's not nothing. That is not nothing. That is something. As always, people are drawn to Jesus because he's the best thing ever. Jen: It will find its way up without having somebody tell you to jump when they say jump. Jen: Now, it's been 18 months. Some of the shiny-shine has worn off. Now, you're in the trenches a little bit more of this being your work and what you’re going to do. I don't know if you know this, but I am aware that sometimes being in the public opens you up for criticism. Is this news to you? Jen: Is this something you know about? Jen: Can you talk about this side of it? The side that is critical of who you are or what you do. How have you handled being vulnerable and staying tender and soft, even with that? Candace: You know what? I really love this topic because if you're ever going to have something that bolsters your joy, there needs to be the voices that are jerks to be banned and blocked from your life. Whether that's yourself or somebody else. I have a core circle of people that they get to say whatever the mess that they want to. Candace: I know that they are saying it in love. I know that they have my best at heart. They would never intentionally harm me because they love me. They are my people. Candace: However, that circle gets a little bit wider. You've got people that kind of know you. You know what I mean? You bring those things to the people in the inner circle, and you're like, "Hey, let me check this against that. Does that sound normal? Does that sound not normal?" You go any further out of that… are you kidding me? All of those can fall to the wayside for all I care. Candace: It's not that a stranger doesn't have the right to say what they want. It's just that it doesn't have the weight to mean as much. Candace: I think that we don't do that naturally. We just hear something negative, and we are like, "Maybe they're right. Maybe." Candace: Then, your whole day is ruined. For some people, do I dare even say this? Not just your whole day, but your whole life because you bought into something that a stranger said that they have no intent on making you a better person but just tearing you down. Candace: I just don't give that much weight. I let it roll off my back when it needs to. Now, there are some things where if it's the consensus of a massive group of people, you do maybe need to check it. Candace: You know what I mean? I'm not saying that if whole world is saying that you're just blind to it. I'm talking about those things where somebody calls you an "Effing Whatever.” Then, you go, "Hey, buddy, what's wrong with you?" Candace: Hey there, why are you so angry? Candace: As a matter of fact, I'd like to go to Target every now and then in peace and quiet. Let's just say that out loud. Jen: Thank you. Yeah. Thank you. I always feel like the person who seems to love me the very most at Target finds me when I am so wretched. I am so gross that I can't even believe they recognize me. How did you even know it was me? Candace: Oh, you found me with my adult acne revisiting because I'm going to menstruate next week? Thank you. Thank you. Oh, and you would like a selfie? Oh, how wonderful. Jen: Oh, always. Always with the selfie. I would like to tell you how many selfies I have taken with women in bathrooms. Jen: I couldn't even count it. I'm like coming out of the stall and washing my hands, and they were talking to me while I was going to the bathroom and I was like, "Why? Why? Why is this happening? Why is this okay?" Jen: It's not. That's my PSA right now for my listeners. If you hear me going potty next to you, just pretend like you can't hear it, and I'm invisible. Let's just let this moment pass and hope for another one to present itself in the universe, but I'm going to let the bathroom go. One last tiny break, listeners. So, I want to give you some free stuff. 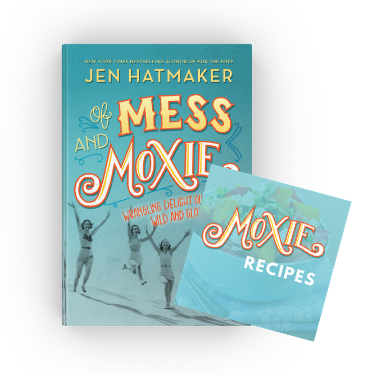 If you're popping into the podcast, but you haven't ready my latest book, Of Mess & Moxie yet, I want to give you some free stuff. So, it's just this simple. If you text the word Moxie (M-O-X-I-E) to 313131, we're just going to send you some free stuff. First of all, you're gonna get to download a bunch of my free recipes. Second of all, we're gonna send you the whole first chapter of the book for free, just so you can take a peek at it, have a taste for it, see if you like it, and that's it. So, if you want a little bit of a freebie in the middle of your day, just text the word MOXIE to 313131 and we'll send you your stuff, simply because I love you, and I appreciate you, and I thank you for jumping in here to the podcast week after week. So, there you go - free stuff for you. Jen: All right. Listen, I mentioned earlier I've got some comedy giants to me. Jen: Mainly women. I'm really drawn to funny women. I like smart funny. Smart funny is my favorite, so I love… I like Tiny Fey. I love Melissa McCarthy and Amy Poehler, who also work in this physical comedy as well. Jen: Mindy Kaling. These are all the women that I just have like googly-eyes for and humor. Men, too. I'm SNL generation. Jen: I've been a Saturday Night Live fan for my entire life. Just this year, one of my newest friends that I met last year actually, was Kevin Nealon. You know what? I could die. I could die happy. Jen: Oh, my gosh. We are heart sisters. Jen: SNL is like my comedy anchor. Who are your people? Who do you love? Who are your comics? What are your shows? What brand of humor are you drawn into? Or writers? I love funny writers, too. Candace: You know what? I try to resist. I try, because I know the formula, but anything Will Ferrell. I am in tears anything Will Ferrell. Candace: His formula is 1) Have a freak-out moment. We all know this. Okay, he freaks out. 2) Sing at some point, inappropriately, when it's not useful for the situation. 3) Be serious sarcastic where the reality is where people don't know where reality is. Like, "Wait a minute, does he really think that?" Hold on, he looks kind of serious about that. Is he that dumb? Candace: I love when somebody just fools you because they are so smart and so witty. His sense of humor always cracks me up. I'm talking like it doesn't matter if it was Bewitched or if it was that movie Stranger Than Fiction. He does that in every stinking movie. I find myself giggly. Jen: That's true. Yeah, he's a master. Jen: I mean, come on. Candace: Steve Martin. Robin Williams. Then, of course, Chris Farley. Now, Chris Farley to me, is kind of like the ultimate. Here's why. The first time I ever discovered that he existed, my mom yelled out from the living room, "Hey, honey. You need to come in here. There's a guy on TV that looks and acts just like you." I'm like, "What?" Candace: I'm like, “This doesn't seem like a compliment.” I walk in, and he's doing the whole Matt Foley, in a van, down by the river. I just remember thinking, "That's similar to how I freak out. Yeah. Yeah. Pretty true. I make those voices." Then, Tommy Boy came out, and I was like, "Rail off. This is gone bat-so. He is my spirit animal." I'm telling you, Chris Farley to me, was just the saddest, most tragic day when he passed. Candace: Actually, I don't know if you remembered this, but during that week, three giants passed. We lost Chris Farley, Princess Diana, and Michael Landon all in the same week. Jen: Chris was exactly what we talked about earlier. He was one of these comics that very much had a dark side. Some of the greatest do. They are just that level of intensity, of humor, of performance art. Jen: It costs people something in a lot of ways. It seems like men, more sometimes that women, but he was one of the absolute greats. That was a real loss. Not just to comedy, but to the world. I love all those guys. I could tell you right now. I could quote any quote from Tommy Boy. Any one. I could do a whole dialogue. You and I could do a back and forth. I can be David Spade. I could literally pull off that whole movie. I love that kind of humor. I love that you love comedy. I think the world is in need of it right now. Jen: It's not small. It's not insignificant. It's not lightweight. I think we are in short supply of humor. I'm so grateful for our master comics who make us laugh in the middle of pain and suffering and struggle and everything. I am such, such a fan of comedy. Let's talk about your book for a second. Candace: Well, in all honesty, I was just getting requests from people to want to know more about who I was and wanting to know how to remain positive and how to find joy. I feel like the video itself was posted at a time where we needed much levity in our society. Candace: Listen, it was election year. It was bat-so crazy election year. Candace: Not only that, it was a time where I literally found myself going, "Wait a minute. What is happening?" We were seeing racial tension pop back up in our culture. I'm sitting here going, "Hold up. Hold up. We did not have Rodney King and all this mess that I lived through as a teenager to see this happening again." Yet, it was. It felt like it was spiraling out of control. To see this video of a lady just laughing in her car for four minutes just made the world go, "Oh, okay. We can pause and remember that it's not the worst. It's not the worst." Jen: Let's do this, real quick. I love this thing that you do online. It's awesome. It's fun. You basically share the things in life that bring you simple joys. That's what you call it. You ask other people to share these little things that also bring them joy, which is a great practice in just paying attention. Jen: Let's look at a couple of your simple joys you put on your website. You just give us your thoughts. Number one, tacos. I feel really strong about this. Really, really strong. I have big feelings about this. Let's talk about your favorite tacos. Why? Candace: You're in Texas, so Austin, hello, we know tacos. I'm in Dallas. Candace: Come on, the queso alone. When you make a taco and you call it "trashy,” that's the best thing in the whole world for me. Jen: Can I tell you something? My son over in Lubbock, who's at Texas Tech, just got his first job in college, and it's at Torchy's. Jen: Do you understand the parental pride? I know. He literally brought the queso to Thanksgiving. Jen: We were more excited about it than the whole feast. Jen: 100%. Pop that baby in the microwave. What's your favorite taco at Torchy's? Candace: The Trailer Park. I do get it trashy. Jen: Of course you do, because you're discerning. Candace: I mean, just fried and wonderful. Jen: I'm so grateful that you're a person who understands the power of tacos. Jen: You also say a good cup of coffee. Hear, hear. Cheers. All the things. Absolutely fundamental part of my morning. What's your favorite? How do you do coffee? Candace: Well, let's just go back here. I am more sugary, sweet tasting than coffee tasting, but the caffeine is what I need to get through the sugar. It's like a double. Candace: I do a lot of Splenda, an ungodly amount to where you feel like there needs to be an intervention and my family meets around me with relatives I haven't seen in 20 years. Then, I also do all the syrups. I don't even care. Put them all in there. Do like nine shots if you want to of something, but do not put whipped cream. Don't put the whipped cream. I want it to be frothy like a latte. Candace: I love the bubbles and the foam. Jen: Listen, if you want nine shots of vanilla, nobody is your boss. They don't know your life. You do want you want. You're a grown up. Candace: You don't know me. Yes. Jen: One of your pieces of joyful clothing -- which you write about this too, and it's really fun -- is brightly colored socks. Candace: Well, here's the deal. I had a Christmas where all I got was socks one year. I know that everybody's like, "Oh, I'm going to cry." Don't cry for me. Just calm down. Calm down. Candace: It was in a trailer house. Deal with it. That's all we had money for: socks and Lifesavers. Anyways, I realized right then, I don't ever want a pair of white, boring socks again. Like, they have to make my feet feel happy. Candace: Now, the world is catching on, because there's this sock craziness going on, and I'm finally excited about it. I'm like, "Variety has now entered my world. I love it." Yeah. Jen: You have like how many pairs ... Just pick a number. How many pairs of colored socks do you think you have? Jen: Is this an embarrassing number? Candace: Embarrassing. It's embarrassing. I would say that I have six drawerfuls right now. Jen: You do not have six drawerfuls. Candace: I have six drawerfuls. Candace: Well, and when people find out that you like the colorful socks, you get them gifted all the time too. It's like, "Oh, thank you." Jen: That is so true. Jen: That's a great point. I'm going to send you a picture because one thing that all my people know that I love is I big, long, leather, feather earrings. Jen: The bigger the better. I get them all the time now. I'll send you a picture. You'll actually die. Listeners, I will put the picture up on this transcript so you can see how many leather feathers I have hanging on my earring… well, I have a whole earring grid. I don't know what to say. Let's talk about smell-good candles. That's another one for you. What's your brand? What's your favorite scent? Candace: I love Bath and Body Works candles just because you can find them on sale. They send you an email. They are like, "Look what you can get. You can get a free candle this month when you buy $100 million worth of body lotion." Candace: I'm like, "It's worth it for the one candle." Candace: I just started picking those up every time I would get coupons for them, and now it's an obsession. I have two candles in front of my TV, two candles in the entryway, two candles on the kitchen island, two candles in the bathroom. You know what I mean? It's in pairs of two. Sometimes they are all opposing scents, and I'm not mad at it. I'm not mad. Jen: I'm not either. That does not hurt my feelings at all. I will light every candle in the house. I don't care. Candace: I'll waft it. I'll go buy one and waft “Fresh Balsam.” Then, I'll waft “Pumpkin Pie.” Then, I'll be like, "This is a great day. Why are people mad at that?" Jen: Right. Right. No, that's just beautiful is what that is. Finally, to which I also give a hearty “Amen,” Chuy's Jalapeno Ranch. Candace: Yes, you could bathe in it. Jen: I mean, not everybody knows about this. We live down here in the land of plenty where this is the kind of stuff we get to have for being Texan. That's our prize. Candace: Yeah, it is. It is. Jen: Talk to everybody about, well, Chuy's first of all, and about Jalapeno Ranch. Candace: Chuy's is a Mexican restaurant. It is not another Chewbacca obsession that I have, which people have confused that. Candace: It is the original Tex-Mex. Come on. Their chips are thin, restaurant style. Their salsa is actually fresh and tastes almost like a mixture of pico and salsa together. I can't explain it, but it's fresh. Jen: My eyes are rolling back in my head. Candace: I know. Then, they have a secret. You can ask for a jalapeno ranch to go with your chips and salsa that come out at your table. Once you discover it, I'm pretty sure you're going to be like, "Oh, why am I addicted? I need to go see Dr. Drew and be on rehab show on VH1." Candace: It is addicting. For some reason, it is the creamiest ranch with the spiciest kick to it. Yet it has the coolness of the ranch so you don't feel like you’ve got to take a Prozac… Not Prozac. Prilosec. Jen: If you want to. Jen: I mean, you're not telling everybody they can't. Jen: If that's the way you want to lean, yes. Candace: It's smooth and creamy but spicy at the same time. You could bathe in it, I'm pretty sure. Jen: Oh, my gosh it's the truest thing. Candace: I'm pretty sure that's what I want for my 39th birthday party theme is Chuy's jalapeno ranch. That's what I'm going to go for. If I'm going to theme out my birthday party. Jen: That's all you need. Candace: That's what I need. Jen: That's it. I have a copycat recipes for Chuy's jalapeno ranch. It's close. Jen: It's really, really close, but there's something about theirs is just magic. I can't recreate the magic exactly, but it's close. Jen: Also, you know about Chuy's happy hour right? Candace: Yes, where they have it in the back of a car. Chips. Jen: Yes. One of my best friends' son's, who's young adult, newly married. They just don't have any money. Remember how a lot of that is? Jen: They, on the regular, go to Chuy's happy hour, where all of that is free. They order a side of tortillas. Jen: Nobody does happy hour better. Candace: No, they don't. They're just like, "Come eat our chips and our salsa and our queso and our ground beef and everything that you want to make your own nachos for free." Jen: It's so glorious that I just feel like I'm probably going to go today now that we've done the power of suggestion here in our conversation. Okay, listen. We're wrapping this up. These are three questions that we're going to ask every guest in the “For the Love of Laughter” series. Jen: Just down and dirty, first thing you can remember. Here's the first one. What's the funniest thing you've either witnessed or watched or personally been a part of yourself that tickled you until you just cried? Tears just rolled down your face. Obviously, the Chewbacca video, so we can't say that one. Clearly, we see that you have the propensity to laugh until you cry. What's another laugh until you cry moment? Candace: I would have to say it was a family moment when I was little. My dad never had a straw or a lid on a cup, ever. He's a chomper of ice, and coffee, he just carries. He carries it around like normal in his car in a mug. Candace: There was one Sunday where he was coming out dressed for church on an icy driveway with an open cup of coffee, and he literally slipped and fell down and the coffee went all over him. He's cussing us all out sideways, and we're on our way to church. Candace: I could not stop laughing. I mean, I know I shouldn't have, but for some reason, I'm the kid in the backseat like, "Stop it. You're going to get us in trouble." I'm like, "Why? He needed to put that in a thermos. He's an idiot. What happened? I've been saying this for years." Jen: It wasn't your fault. Jen: Why are y'all getting cussed out? Candace: Yeah, he should be cussing out the fact that he's wearing boots with a suit on ice, and he has an open mug of coffee about to put it in a car that it doesn't even fit a cup holder in there. Like what? Jen: No, that is laugh-worthy. One lesser known fact about me and mean thing that I don't share very often, is that I think it's really funny when people fall down. Jen: Like videos where people fall down make me laugh so hard, especially when they're kids. Jen: What's wrong with me? I need help. Jen: I'm not a monster. Candace: I'm not a monster. Just children that are already closer to the ground. Jen: Totally. Okay. Finish this sentence: "A world without laughter is like a blank without blank." This is tricky. Candace: Oh, it's not tricky, because I immediately thought of a song lyric, so I'm going to steal it. A world without laughter is like a sky without stars. Jen: That's good. That's what I'm going to name this podcast. That was really, really good. Jen: Last one. This is the question we ask literally everybody in every series. It’s a question posed by Barbara Brown Taylor and it's, "What's saving your life right now?" Candace: It is like everywhere across the board. Snuggles with kids. Hot cups of cocoa. Literally, just feet up in chairs. Anytime they recline, my feet are up. It is finding naps in the middle of the day. I mean like rest is so good right now. Yeah. Jen: Atta girl. You deserve it. Jen: Because you have had your foot on the gas. Jen: You have been working hard. It has brought so much joy to the world and to all of us. You are so loved and so cherished. I could not be more pleased that you're getting to kick your feet up for a hot minute, even though you just got your edits back, so I'm sorry about that. 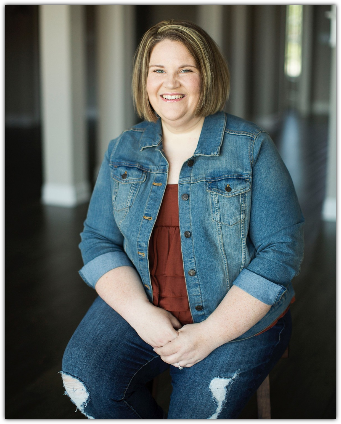 Listen, thank you, Candace Payne, for being on the show today. Thank you for being who you are. Thank you for making us laugh and smile and tell the truth. Just embrace this life. You are a treasure, an absolute treasure. Candace: Thank you so much. I'm going to cry now. Jen: You're welcome. You're welcome. Have a great day. Jen: Isn't she fun? She's cute and spicy and sassy and truthful. Everything that I love in a person. I am so glad to be new friends with Candace. Guys, over on my website, I'm going to have everything we talked about. 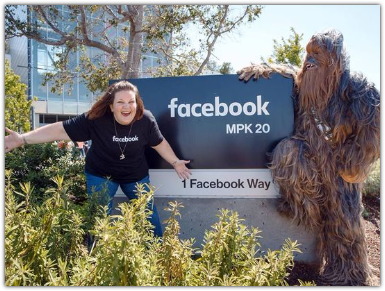 Just in case you haven't seen Candace's hilarious video with Chewbacca, we'll for sure have that linked over there plus her book, her website, her social media pages… all of that. Because you're going to really enjoy following her because she has a lot to offer. She is not a one trick pony with one video. She has so much to bear. I think she's darling. You guys, we have so many great guests in this series. I'm just like freak out, just freak out. It's just some heroes and legends and the funniest of funny people. You're going to want to come back week after week for “For the Love of Laughter.” I promise you that. Thanks, you guys, for listening. Thanks for coming in week after week after week after week. This has just been the most fun. I love this podcast. I love you. I love hearing what you think about it. I love your responses, and we always comb through your comments. We are grateful for them. Thanks for subscribing and leaving writings and reviews. That's all super helpful for any podcast. I sure appreciate it when you direct that feedback to me. You guys have a fabulous week. You will not want to miss next week's episode, and I cannot wait to bring it to you. Okay, see you next week guys. 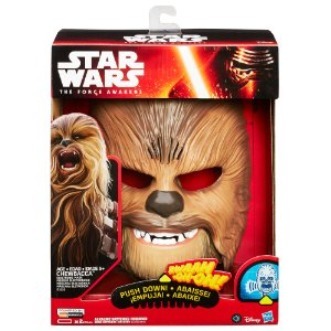 Get Yourself a Chewbacca Mask!